We understand that arriving at a doctor’s office for the first time can be nerve racking (yes, that’s chiropractor humor). Filling out paperwork, learning new faces and names and getting to know your way around the office can be an overwhelming experience. That’s why our aim is to remove any stressor that can cause unnecessary tension. We want to make you feel comfortable. This area of our website is designed to help you take care of items necessary for your visit prior to arriving, in the comfort of your own home. Chiropractic care is a conservative, effective approach toward giving your body the opportunity to heal itself. 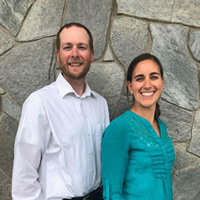 Doctors Garrett and Chelsea Haponski are specially trained to help alleviate all types of health issues without the use of drugs or surgery. If you have never been to a chiropractor, we will make your visit to Keystone Chiropractic as comfortable as possible. Call us today to discuss how you can be helped. Please download, print and fill-out the following documents and bring them with you to your first appointment. To view the documents you will need a pdf viewer such as Adobe Reader.